Heidi's concentrations in the UNM, Ridgecrest and Nob Hill neighborhoods go beyond single family home sales and purchases. Small apartment building sales and renovations in the South Carlisle cooridor of Albuquerque have become another specialty. 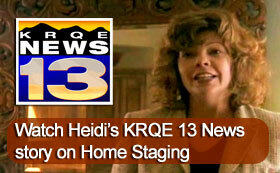 Heidi's concentrations in the UNM, Ridgecrest and Nob Hill neighborhoods go beyond single family home sales and purchases. Small apartment building sales and renovations in the South Carlisle cooridor of Albuquerque have become another specialty. 10 years of makeover work in the Knob Heights neighborhood has resulted in significant contributions to the revitalization of the area. Heidi has a trained eye for worthwhile projects - homes, duplex, triplex, fourplex and small commercial properties making her imput on the planning team invaluable to home owners and investors alike. Heidi J. Gray founded H. Gray & Company, a Nob Hill Albuquerque based full-service real estate sales & property management company, in 1999. In 2013 H. Gray & Company incorporated. She is a Qualifying Broker and a lifelong resident of southeast Albuquerque area, a full time active member of the Greater Albuquerque Association of Realtors® in excellent standing with her professional trade organizations and the NM Real Estate Commission & a 2009 graduate of the GAAR Leadership Development Program.